This market is a small, locally sourced, long-standing place. It’s located very close to the majestic Monteiro-mor botanical park, and is another (one of many) of the places where I shop for fresh, organic veggies. I often wonder if I spend too much time in markets, but I quickly realise that going to those huge supermarkets goes against any intention of supporting local farmers, fishermen/women, butchers, etc. So after writing at the park, I often stop at the organic restaurant inside the market for a treat or even a full meal, or simply to shop for the ingredients I might need. 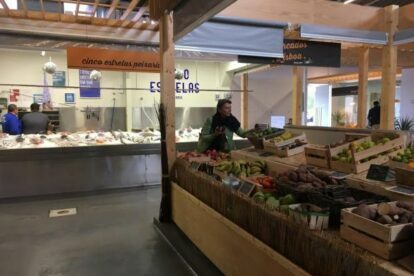 Another reason why I love this market so much is because it has established itself as a fully organic market, including the fish, the traditional cheeses, and the meat being sold. So I am always very happy to come here and get to know a bit more about the lady selling the fish or the old man selling the cheese. If you love a taste of simple markets, honest sellers and unexplored city areas, this is the market for you!